A successful puzzle game takes a few key components: a goal, resources to meet that goal and a space for the player to devise their own solution. No matter what tools the player is given, there’s always satisfaction to be found in exploring the puzzle’s possibility space and proudly looking back on a completed challenge. 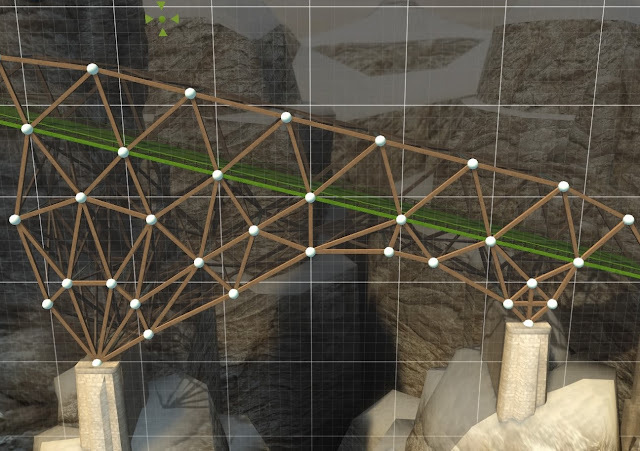 Bridge Constructor, the newly released PS4 game by Clockstone Studio, gets this. Each aspect of the game encourages the player’s experimentation, laying down some basic, consistent rules and an easily understandable win condition: using materials and anchor points, construct a path from one part of the map to another so that a car or a truck can pass safely. The concept has notably been done before in other games to varying degrees of success, so much so that I’d prefer to assess Bridge Constructor as an iteration of a pre-existing puzzle, just as I would with any new picross, sudoku or tengram game. 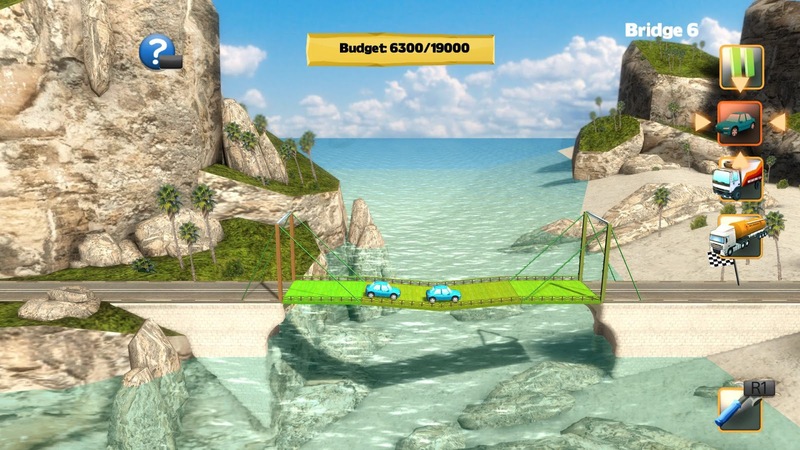 The question then is how well does Bridge Constructor present itself? 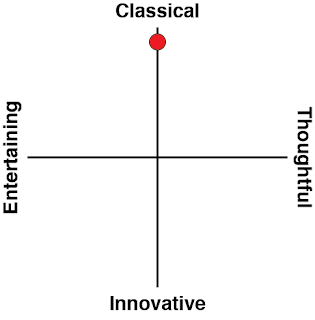 Overall, there are some inconsistencies in design, but it also gets a few things very right. 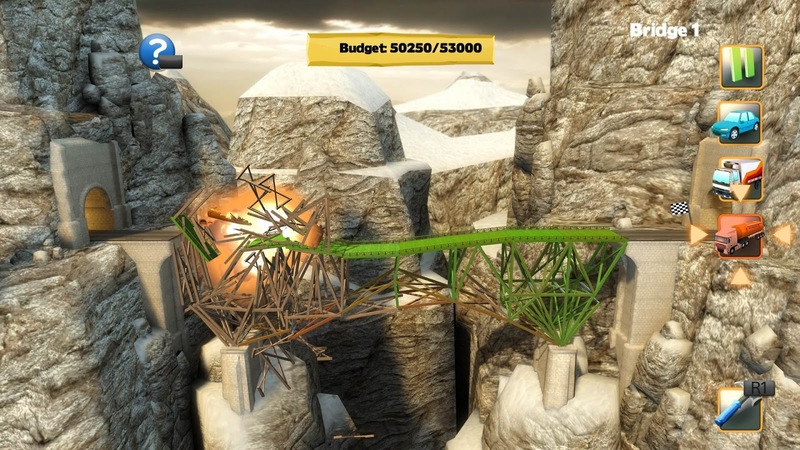 The game is broken into a series of levels, each challenging the player to bridge a canyon, river or chasm with a limited budget. Players can utilise four materials – wood, steel, concrete and cable – in order to construct a stable structure which can bear the weight of two cars or, for confident builders, two trucks. Score is rewarded based on how much money is left over after completing the level, and it cumulatively goes towards a worldwide online leaderboard. 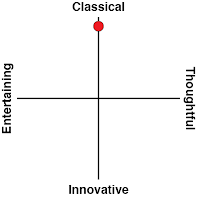 The game is split into two worlds – Camituga, which largely features safe level designs with defined solutions, and Tiltin, where the developers abandon realism for more outlandish level designs. The Tiltin levels are much harder, but also feel like bonus levels unrelated to the game’s proper campaign, requiring you to perform silly tasks like send cars flying or hurtling down enormous slopes for you to succeed. Each world is split up into a few smaller sections, with each section hosting around half a dozen levels. Both the worlds exhibit fairly standard level design and there’s nothing too outlandish to throw players off guard. Regardless, there are a few design choices which work in Clockstone Studio’s favour. Being able to test your bridge at any time, and being able to edit your creation immediately after something goes wrong makes the overall experience much more conducive to creative play. By eliminating the delay between planning and testing, players can glean where changes need to be made in their designs. Similarly, each individual piece changes colour to indicate how much stress is being placed upon it so the player understands the rules the game plays by. I mention this because the physics in Bridge Constructor aren’t particularly true to life – structural engineers might struggle a little to understand how anchor points work, for example – but the game’s internal logic is always consistent. Early on, it teaches players that triangles are the strongest shape, and this rings true for nearly every case as the game continues. Later levels vary in scope and complexity, requiring longer bridges with more unorthodox anchoring points. That being said, joints, supports and cables bend and strain in predictable ways, and it won’t be long before players learn the difference between a stable structure and one destined for collapse. There are some performance issues which keep the game from being a seamless experience. Loading takes a while, even though the game is not particularly graphically intensive, and after completing any level the game takes its time while recording your score in its online database. The controls also don’t feel perfectly adjusted to the PS4, with the control stick feeling awkward to execute the click-and-drag motions required. These are all irritating issues but they don’t affect the gameplay in any way, so it’s not hard to build a bridge and get over it (oh ha! Harvard gets the first crazy pun of the year in - ed). Barring performance, predictable design and somewhat low production values, Bridge Constructor is still by all means a proficient puzzle game. Successfully latticing wood and metal and cabling to ferry lorries across a steep ravine feels great, and especially if you managed to cut costs and earn a high score. Furthermore, mechanics and optimisation which encourage player experimentation and reward creative thinking makes Bridge Constructor a satisfying journey for puzzle fans on the PS4.